President Barack Obama and presidential candidate Bernie Sanders met on Thursday, June 9, 2016 to discuss “where do we go now” following the primaries and caucuses in California and five other states. Shortly thereafter, he endorsed Hillary Clinton, in a paid video by the Clinton campaign. In the announcement, the president said that the differences that exist in 2016 between Clinton and Sanders are no different than those that he and Clinton faced eight years ago. This sounds nice; it has a certain symmetry to it, but it may not be accurate. In fact, it is likely an inconvenient truth that it is not so and failing to recognize that will make it more difficult to garner the backing of Sanders and his supporters in the fall campaign against presumptive Republican nominee Donald Trump. 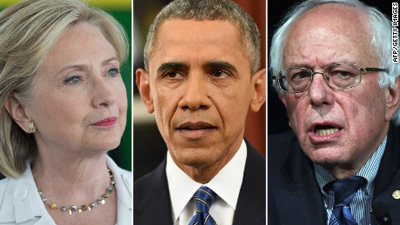 Acknowledging the differences between 2008 and 2016 can be key to bringing the Sanders – Clinton – and Obama wings of the Democratic party together and fashioning not only a successful campaign this fall, but developing a renewed purpose with a progressive perspective for the future. But, looking back on the 2008 campaign, the substantive differences on policy were vanishingly small. There were big fights over judgment (the Iraq War) and the claim to history (the first African-American versus the first woman nominee). But on policy grounds, Clinton and Obama were all but the same candidate. Their most salient disagreement was whether the Democratic plan for universal health care ought to include a mandate to buy coverage. Clinton insisted the mandate was essential; Obama opposed as a matter of principle. They debated it ad nauseum. But in the end, this squabble was much ado about nothing. When Obama became president, Clinton’s top health-policy adviser was tapped by the White House to run point reform — and the individual mandate became a bedrock principle of Obamacare. This is relevant today, because falling in line behind Obama in 2008 required Clinton to swallow little more than personal pride. It did not require sacrifice of any dearly held principle or policy stance — only surrender of the idea that she would have made a better president. In 2016, the contested terrain is not symbolic. Consider Sanders’ call to break up the big banks against Clinton’s proposal to better regulate Wall Street. This is a difference of orientation, not degree. And it is but one of many such differences. The profound differences between Sanders and Clinton, coupled with Obama nearing the liberation of the post-presidency provide an opportunity for more progressive change. In a nutshell, here is what each of them have to do to make this happen. a. Promoting dramatic change in the way in which we choose our nominees for president. What about developing a plan so that in 2020, Democrats choose their nominees through four regional primaries beginning in March or April? No more caucuses, no more inflated importance for small states, no more parochial messaging for tiny portions of the country. b. Promoting concrete ways to reduce the role of money in politics. Sanders is the master of fashioning a national campaign based on small donations. This could be coupled with supply-side democracy to eliminate the financial connection between Wall Street and other vested interests in the business of the people. c. Working with schools to help students develop into more active and informed citizens in our democracy. This will include drastically reducing (or eliminating) the role of standardized tests and replacing them empathy and concern about the common good. d. Addressing the issue of the “angry white males” who have gravitated to Donald Trump when a New Deal or Great Society agenda would have been much more beneficial to them. e. Explaining to the American people who the word “socialism” is not a bad word, and in fact is an option for addressing most of our economic problems. 2. The President can take off the shelf all the progressive ideas that he had to put away because of a recalcitrant Republican Congress and Supreme Court. His memoirs will provide an outstanding opportunity to join with Sanders and millions of others in placing a genuine progressive agenda before the American people. He can write his memoirs with no fear of having to submit them to Congress and having them mired in gridlock. He will be free to speak his mind. He might also say that getting cozy with Wall Street and other big donors was a necessity for him to become president, but that the American people are now willing to conduct politics without big money. Perhaps most importantly, in his retirement, he would be wise to follow the outreach path of Jimmy Carter rather than Bill Clinton so that he is no longer entangled with shady moneyed interests. Perhaps Obama and Sanders discussed some of those ideas on June 9. In all likelihood they didn’t. But Bernie can push this agenda and perhaps Obama will be a willing follower, knowing that Hillary will be his likely successor.